Here’s a well-crafted production by the Dallas Stars after yesterday’s morning skate in which former Miami forward Reilly Smith participated for the first time as a professional hockey player. 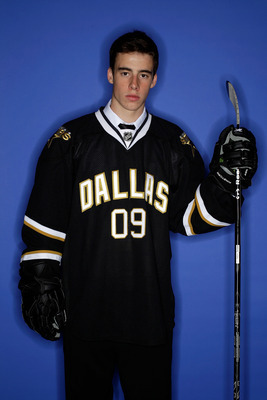 Good luck to Reilly and the Stars down the stretch. Click HERE as the video won’t automatically embed. Well, that’s precisely what the RedHawks have in front of them this weekend as they look to secure their third trip to the Frozen Four in four seasons. When you break it down, there is absolutely no logical reason I can think of why Miami shouldn’t win this regional going away. Sadly though, it doesn’t always turn out that way as we well know. This region is so ripe for the taking, it’s highly possible the #1 seed in the east, Union, won’t even make it past a well-rested, but certainly not powerful Michigan State program with a new lease on life. After the shellacking Miami put on them in Oxford a few weeks ago, the Spartans had to sweat out the CCHA’s championship weekend awaiting word on whether they’d have an opportunity to continue their year. Unfortunately for the Dutchmen, the Spartans have much to prove and will be well-motivated to send the ECAC champions back to Schenectady empty-handed just like last year and I think they will. When you look at the River Hawks of Lowell, on paper it’s hard to believe they have 23 wins in what was a down year for Hockey East. Traditionally strong programs Vermont and New Hampshire were down and mediocre squads like UML, Maine and BU were able to compete for a championship with only BC emerging as a true national title threat. Heck, Providence whom Miami destroyed 6-2 at the Denver Cup was a threat in that league this year and dispatched the River Hawks (WTF?) in the Hockey East playoffs in three games. In some of the worst uniforms I’ve ever seen, the tiny Lowell squad is made up of guys I’ve never heard of before. Again, none of this means anything. Miami has traditionally struggled with small, quick (though I have no idea if the River Hawks can skate) Hockey East teams in the past but this year’s edition of the RedHawks has speed and our traditional size to burn. A small, quick team such as Michigan State has had absolutely zero success against Miami this year as evidenced by our 4-0 record against the Spartans. You’d like to think this game is Miami’s to lose, but in a one game format, absolutely anything can, and usually does, happen. And, apparently their best player, someone named Riley Wetmore (12-25-37), a nearly 23 year old junior (good lord), has a broken hand to deal with and his effectiveness will undoubtedly be limited against a Miami squad that can bring physicality on every line. 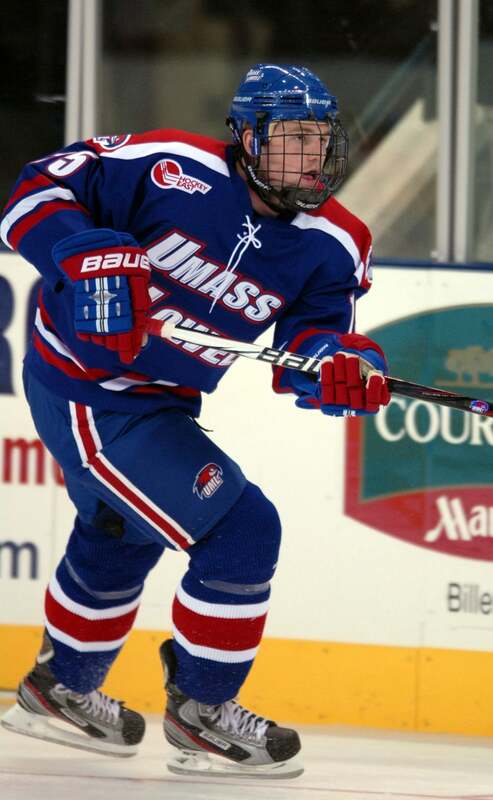 And, their leading scorer, Scott Wilson (16-21-37), is just a freshman who lacks experience in big time games, though he is also advanced in age (20). Size, speed, experience, goaltending, coaching. They all belong to Miami in this game. The one thing Lowell has in its court is the home ice advantage as I’m sure the River Hawks will feel right at home playing hockey in a dump like Bridgeport. 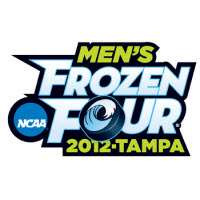 In looking at this regional, Miami has a Frozen Four run set up nicely. In addition to their advantages over UML, they are 4-0 against Michigan State and would either face the Spartans or Union in the second round who has no scholarship players and plays in the relatively weak ECAC. Hopefully, the hockey gods look favorably upon RedHawk Nation this weekend and we are fortunate enough to advance. Regardless, it should be an exciting weekend. But, you have to feel like its our time. We’ve endured disappointing regional performances before so that’s always a cautionary point. Yet, this Miami team is peaking at the right time and should come into the weekend with the confidence knowing they’ve been here before, and more importantly, they’ve done this before – which no one else in the region can say. Hell, Lowell hasn’t been to the tournament in 16 years. Miami is led by its 10 seniors and it feels like things are coming together at just the right time. Don’t let basketball fans have all the fun – BRACKET CONTEST! 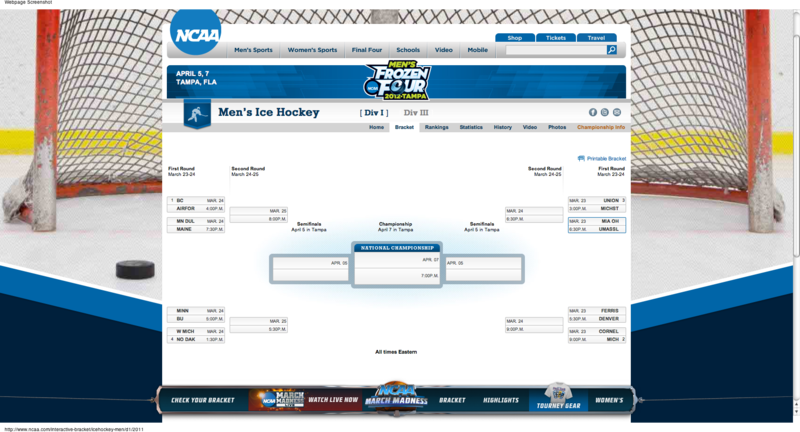 First off, before you get to picking your brackets, take a read at College Hockey News’s interview with NCAA Men’s Ice Hockey Committee Chair Sean Frazier. While the PairWise is nearly Bible when it comes to the selection process, Frazier weighs in on the selection process and the subjectivity that the committee has. Secondly, jump over to the CHN Bracket Contest and submit your picks. You saw my picks last night/this morning, and they match up there. Whomever wins the bracket contest from our readers gets the best prize ever. Here’s a current breakdown of all the picks from NCAA hockey fans like us, as of 1:45PM this afternoon (courtesy: collegehockeynews.com). It seems the RedHawks are instilling a lot of confidence in fans right now, as 54% think Miami will make it to the Frozen Four in Tampa. I can’t say I’m opposed to this one bit. As we noted as the pairings were announced, #2 Miami will face #3 UMass-Lowell in Bridgeport, Conn. on Friday at 6:30pm EDT. If they should win, they would face the winner of #1 Union College and #4 Michigan State. Check back this week for full previews and analysis.